One plus one is one of the best selling smartphones which provides awesome features at a reasonable price. It is available in two variants- 16GB silk white and 64GB sandstone black with a price of $298 and $348 respectively. It is one of the best value for money smartphones available. It is packed with a Qualcomm Snapdragon 801 processor with 2.5GHz Quad-Core CPUs. The OnePlus One's operational capacity and performance are enhanced by Qualcomm's heterogeneous computing approach. This chipset harnesses the robust integration of many components for incredible speed and power efficiency. Among them, the custom Krait CPU architecture for sustained peak performance, integrated 4G LTE connectivity and Adreno 330 GPU for superior graphics and gaming experience, boosting 3D interfaces, colors and textures. Using the new standard EMMC 5.0 you’ll be able to access and write on 16GB or 64GB of internal flash memory in the blink of an eye. 3GB of LP-DDR3 RAM running at 1866MHz allows flawless multitasking of even the most demanding apps. Enjoy blazing fast and smooth connectivity whether you're around the corner or across the world with OnePlus One powered by Qualcomm Snapdragon processor with a 4G LTE multimode modem. Other connectivity options include Miracast (Wi-Fi Display), Bluetooth 4.0, Wi-Fi 2.4/5GHz 802.11 b/g/n/ac, GPS & GLONASS, NFC and USB OTG( On-The-Go file transfer). With OTG support we can easily transfer files between the phone storage and an external USB storage device. One plus one has a 13 Megapixel SONY EXMOR IMX214 sensor in the rear with dual LED flash.Boasting a 13 megapixel Sony Exmor IMX214 camera with f/2.0 aperture, the OnePlus One camera takes amazing pictures even in low light conditions. The camera boasts 6 physical lenses. The photos will be more precise and detailed without suffering from distortion often caused by lower apertures. With an impressive 5 megapixel camera in the front, selfies will be more captivating than ever. The extra-wide 80º viewing angle captures more area than other phones. So the pictures will include more background without distortion. With the energy efficient Qualcomm Snapdragon 801 chipset, the One’s 3100 mAh battery fits perfectly into the sleek body. The energy efficient display features CABC and DRAM (Display RAM) technology that adjust the level of backlight and differentiate between dynamic and static content on your screen. These technologies reduce the power consumed and allow you to run all your apps and data services, all day long. 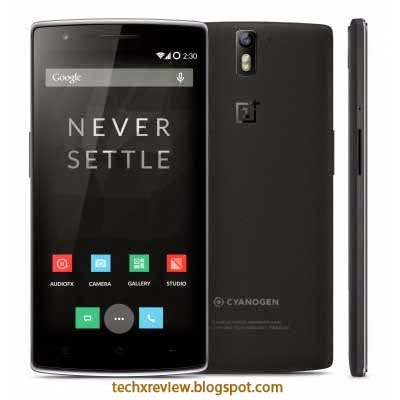 The OnePlus One features a 5.5” 1080p full HD JDI screen with LTPS technology for a higher pixel density and sharper picture. The IPS screen instantaneously responds to even the slightest touch with TOL (Touch On Lens) technology, which removes the distance between the touch sensor and the display panel. It also makes the screen 300% more shatterproof than OGS technology. Gorilla Glass 3 protects the screen against scratches, and with 178 degree vision, you can enjoy it from just about any angle. Fitting so much high end hardware into such a compact body took some inventive design. Vowing to never sacrifice on build quality or industrial design, OnePlus One provides the best user experience with its unique design. Measuring just 8.9mm, the OnePlus One is ergonomic and easy to grip, with a tapered edge of just 4.6mm. Choose either Silk White or Sandstone Black, both unique textures, for the feel of a premium device that is built to last. When you hold your OnePlus One, you’ll know every single piece was carefully chosen, placed and designed. Custom cut and engineered PCB boards are specially dyed and treated with a matte black finish, with each part meticulously aligned to be visually pleasing and functional. Even the most delicate inner components bear a OnePlus logo. It uses Android kitkat with Cyanogen 11S. Powered by Android, Cyanogen brings the features you love while giving you the freedom to mold your mobile domain. Options like Quiet Hours, an enhanced home screen, and a configurable Quick Settings panel are just a few ways you can control how you and your One connect. Personalize it by picking from thousands of themes or mix and match icons, fonts, wallpapers, and more to create your perfect look. Stereo recording and tri-microphone noise cancelling technology are incorporated directly into the OnePlus One. Three microphones work together to identify, isolate and enhance your voice, while simultaneously filtering background noise. Use of the third microphone increases voice clarity by up to 80%. Launch your favorite apps more quickly than ever before with the on screen gestures. Tap twice and your screen will come to life, or draw a simple image on the sleeping screen to launch your preferred app. The screen will respond even if your hands are wet. . Use either the three capacitive keys at the bottom of the screen or turn them off and instead enable the on-screen buttons. In the truest spirit of ‘Never Settle’, navigation is now exactly how you prefer it to be. OnePlus One is packed with different sensors like Gyroscope, Compass, Proximity Sensor, Light Sensor and Accelerometer which enhances the flexibility of the device.